Left untreated, mole crickets can become destructive to the lawn. To prevent damage from occurring or getting out of hand, mole cricket elimination, or killing mole crickets, is often the only recourse. These insects can be recognized by their gray-brown, velvety bodies and wide spade-like front legs, which are well adapted for digging. Adult mole crickets are about an inch to inch and a quarter in length with wings. The nymphs, or immature mole crickets, are similar looking but are smaller and have no wings. Mole cricket damage usually occurs in warmer climates, especially areas along the coast of the southeastern United States. Their damage can be recognized by irregularly raised burrows and dying grass. These insects are often attracted to lawns that have an abundance of thatch—a thick, spongy mat of runners and undecomposed grass clippings on the soil surface. Improper mowing and excessive water or fertilizer can lead to this condition. Mole crickets find this to be a suitable habitat and will eventually overwinter within deep burrows, which are created by their extensive digging. Once the soil warms up in spring, they will work their way up to the surface to feed on grass, usually at night. This feeding also takes place in the upper inch or so of soil. Females will begin laying eggs just beneath the soil surface in spring and early summer, with hatching coming shortly thereafter. The nymphs will then develop during summer with damage seen by mid to late July. Effective mole cricket control depends on the season and current life stage of the pest. Overwintered mole crickets become active in early spring. While treatment during this time reduces tunneling damage, it may not be as effective as later treatment. Summer treatment is more effective on the vulnerable nymphs. However, parasitic nematodes, which attack the adults, can be applied in spring before females lay their eggs. By the time damage is clearly visible, control is more difficult. To check for mole crickets early in the season or the presence of young nymphs, you can flush them out with soapy water—about two tablespoons of dishwashing liquid to one gallon of water. Pour the soapy water over a 1 to 2 square foot area. Do this early in the morning or late evening. If mole crickets are present, they will surface within minutes. If at least two to four mole crickets surface, then target the area for treatment in summer. Irrigate well after applying the soapy water. 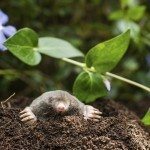 Biological controls include predator insects, like crabronid wasp and tachinid fly, as well as nematodes, which are best applied in early spring (Mar-Apr) or fall (Sept-Oct) for adult mole cricket elimination. Chemical insecticides, such as Imidacloprid (Bayer Advanced, Merit) are normally applied in June or July to kill the small nymphs. They can be controlled with sprays, granules, or baits. Apply when overnight temps are at least 60 degrees F. (16 C.) and irrigate the area beforehand. Moist soil helps with penetration of the insecticide and encourages mole crickets to come to the surface to feed on bait.